The application of construction dispute procedures has changed dramatically in the last decade. This has resulted in an increased use of Alternative Dispute Resolution in many countries, and mediation in particular. Construction is one of the major industries using mediation, in the UK and in many other countries such as the US, China, Australia and New Zealand. This expansion in mediation has been helped by encouragement from governments, although it takes diverse forms in different legal jurisdictions, for example: court rules to encourage this use (as in the US and UK); the courts’ own mediation schemes or programmes, or legislation-backed programmes; or the use of industry driven mediation clauses in standard form contracts. These developments have taken place extremely rapidly. They represent significant changes to the legal environment within which the international construction industry conducts its business but, to date, there has been little research on their impact. All these initiatives have inevitably led to a developing legal jurisprudence concerned with the validity of contract clauses or with providing statutory interpretation of the rules requiring or governing practice. This has important consequences for the construction industry because legal uncertainty increases the likelihood of dispute, which is not only costly for the disputants but can be damaging to national and global economies. 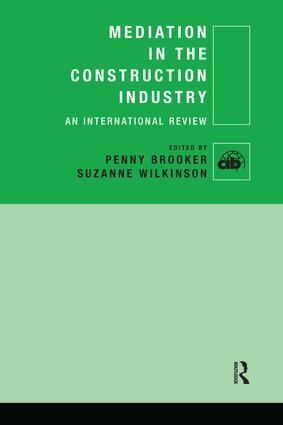 This book identifies the emerging international practices within construction mediation, and seeks solutions to the many legal and commercial challenges which they pose. It presents an international collection of reviews by experts, and allows a comparative commentary on the practice of construction mediation and the legal challenges facing its development.